My Notting Hill: Painted Faux Agate Walls - WOW! Painted Faux Agate Walls - WOW! 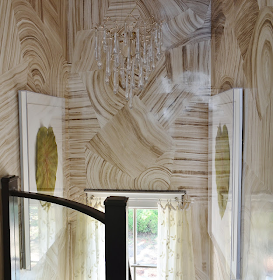 I came across these amazing faux agate walls by designer Susan Jamieson of Bridget Beari in the 2012 Richmond Show House via The Scout Guide. Combined with an amazing painted floor, this is drop-dead, high end gorgeousness. Love Susan's choice of a glass railing to keep the views open. 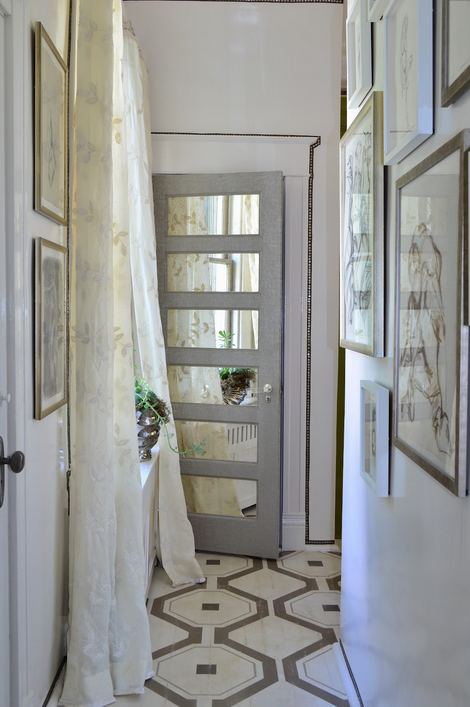 Braid trims out the room and an antiqued mirror door is covered in fabric adorned by a P.E. Gueirin acrylic door handle. 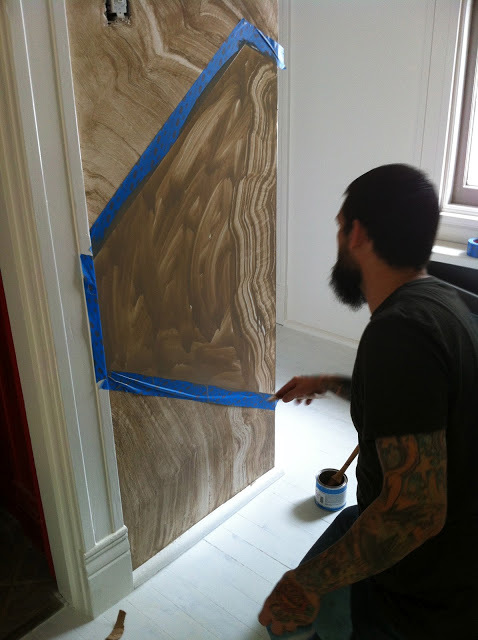 Here's a behind the scene of how these walls were created by Jeff Ragland of Holtz. The custom shelves are painted in Pickle No. 37, part of her custom color line for Fine Paints of Europe. WOW, that is stunning!! I love it!! they did an amazing job with the finish would love a master bath done in that. Wow is right. What beautiful details everywhere. This is sooo pretty! The wow factor & the attention to detail is just beautiful. Love the pattern of the floor duplicated in the casing & that green - perfect! That man is a master! Stunning, Michele! So unusual and beautiful. There truly are some talented artists out there. WOW...that blew me away....how gorgeous. Lots of eye candy here. Thanks for sharing these lively shots. Now that is super chic!! Very, very creative. I like, I like! Don't think I've seen anything like it. OH, this is gorgeous. LOve the craftsmanship.The shelves are stunning! I love everything about this designer. The freshness and airy feel when using browns is beautifully done. Wow, all I can say is WOW. I love to see how Holtz was faux painting...so awesome. 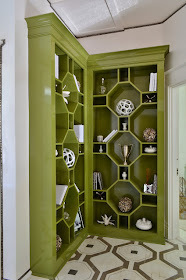 Love that custom curio bookcase. this is so gorgeous it takes my breath away! Michele how incredible! Very find craftsmanship. the walls and floor; those green shelves. OMG! Just goes to show you how you can make even the smallest, most insignificant space the showstopper. A-ma-zing. Thanks for sharing. Brave choices and obviously a lot of faith in their designer. I am always impressed by such leaps of faith. Thanks for showcasing our space at the Designer House! Check out our before and after videos too! Thanks for sharing this gorgeous space! I have been feeling just a little bit bored by the sameness of even beautiful interiors lately. This absolutely wowed me!! I went to see this a few weeks ago, and her space was by far my favorite! 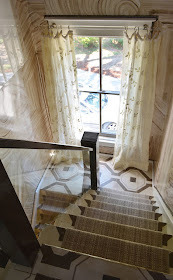 There were so many beautiful surfaces that I just had to touch -- the wall, the laquered bookcases, the curtains woven with raffia, and a gorgeous glass stair railing. I would've reached out to touch the chandelier if I was tall enough! It was all marvelous! Saw this in person and let me tell you, its amazing!